Do you want to know the ins and outs of the union co-op model? Well, the first step is to read the Sustainable Jobs, Sustainable Communities: The Union Co-op Model, the union co-op template written by representatives from the United Steelworkers, Ohio Employee Ownership Center (OEOC), and Mondragon International USA. This union co-op template takes you through the creation of the model, mission and vision, principles, and structural components of the model. 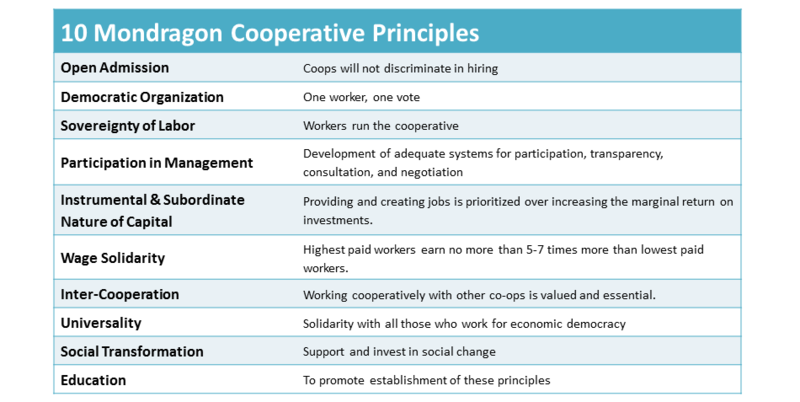 The union cooperative model implements ten Mondragon principles. These principles articulate the cooperative and participatory values that have guided Mondragon’s business success. They are labor-based and rooted in a variety of movements and experiences. These principles affirm the freedom and empowerment of working people and the value and importance of community. The Co-op of Co-ops harnesses the power and possibilities of the worker movement and co-op movements. Creativity and resources are pooled to make things happen. This has been a cornerstone to the success of the Mondragon cooperatives in Spain. A multi-sector association of co-ops (Co-op of Co-ops) is created to take advantage of opportunities in certain business sectors and buffer periodic or long-term downturns in other sectors. The Co-op of Co-ops protects and supports workers — by providing training for new and/or expanding job opportunities; identifying and developing strategies that foster business success; and launching new union cooperative businesses.